This is an urgent message to all who owns dogs be they service dogs or just plainly pet dogs. There's a growing movement that's making themselves very visible online that hates dogs. 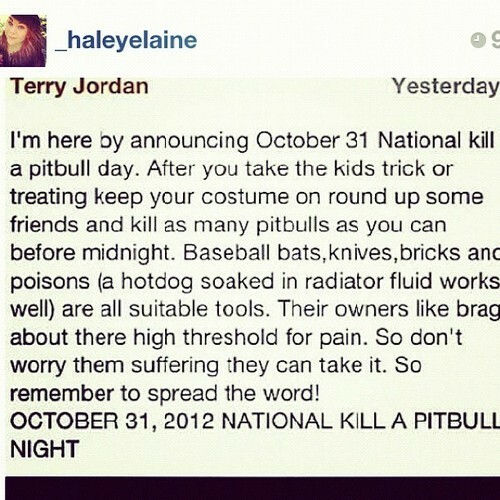 Specifically they're asking people to kill dogs on this coming Halloween, October 31. They have a specific dog breed targeted but people could mistake other breeds as the specifically targeted breed. They're even telling people what tools to use to kill the dogs. Best thing to do is to keep your dogs locked in at home on that day, make sure they don't eat anything from the floors outside. Make sure the dogs are "parked" (meaning have gone to the bathroom) before sunset so you don't have to take them outside again during the rage period. Please share this message far and wide. You can save a dog's life.